WARNING - SPOILERS ARE INCLUDED!!! HOUR TWO: "SHALL WE GATHER AT THE RIVER"
Wow! Season 2 is finally here. I’ve never worked on a TV show quite like FALLING SKIES before. We started shooting in mid October of 2011. We finished shooting March 1 of 2012. We’ve been editing and getting the VFX ready and getting the music and sound mix ready since then… And here we are mid-June and we’re finally airing. Truthfully, it’s a great process, creatively. The shooting phase is as fast and furious and crazy and from-the-hip as any TV show, but there’s actually time to contemplate and get it right in post-production. Nevertheless, if you’re a fan of the show, like me... I bet it’s felt like a LOOOOONG time since Tom Mason walked aboard that spaceship. Well – now we’re back and I think you’ll agree with me that the episodes are bigger and badder and faster and (hopefully) better than last year. With the strong encouragement of Mr. Spielberg and Michael Wright, president of TNT television, we we all wanted to really step up the level of production and storytelling for the fans this year. This began with the hiring of Remi Aubuchon . Remi had a lot of ideas about how to keep the good stuff we’d established in Season 1, to diminish the things that weren’t as strong and, overall, to amp up the action and tension. One of the first things he and I discussed was the idea of freeing the 2nd Mass. from the confines of the school where they’d been pinned down almost all of the first season. The school served it’s purpose in the beginning, and it was a good decision from a budgetary standpoint, as it gave us a home base. But it had always seemed to me that we stayed their too long. 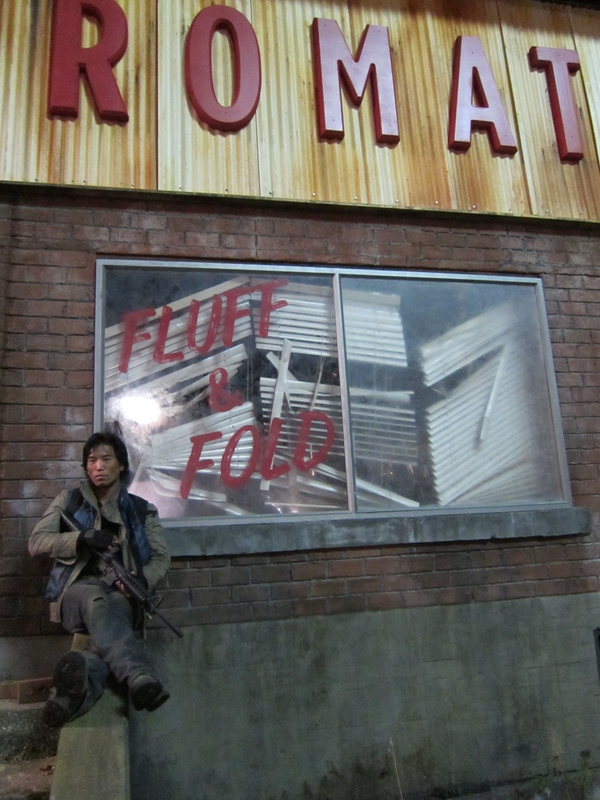 After the skitters discovered our heroes, in last season's episode 5 and 6, I’d always felt we should have moved out. But budgetary restrictions forced us to stay until the end. Steven Spielberg’s original conception of the series was that the 2nd Mass would be nomadic. But nomadic isn’t practical TV. On the other hand I’ve never been a big advocate of “practical” TV. I’ve always had the attitude that, if it’s the right thing for the show we can figure out a way to make it work. Rob Gray returned as our Production designer. Rob is an amazingly creative guy. Like me, he loves to figure out new and different ways to do things, even if, at first blush, it looks like the hard way. he attacked the idea of the moving vehicle-based refugee camp with relish. We shipped out the vehicles we onwed from Toronto and started looking for new ones on the west coast. 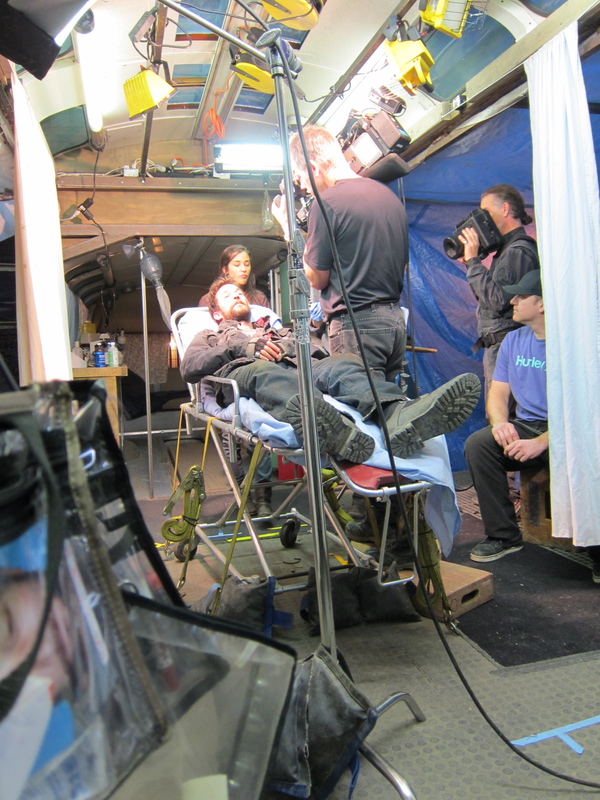 One of Rob's big ideas was to get a city bus and convert it into Anne Glass' medical bus. Also, Chris Faloona was not able to return as our Director of Photography. He had taken a job on the UNFORGETTABLE. It pained him, and me, for him not to come back. But soon a new opportunity presented itself. 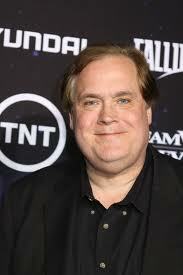 I called Nate Goodman, who I had worked with on HEROES. Nate and I have a great working relationship. We really feed off of each other's creative ideas. I was so happy when he came aboard. Soon after, Remi and I had a lunch where he briefed me on where the season would be headed. 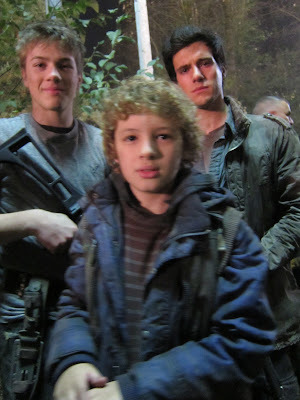 As I left that meeting I grabbed my cell phone and called Connor Jessup in Toronto. “Son,” I said – “I’ve just heard what the plans are for you for this season. And my strong advice is that you get a trainer and start eating your Wheaties! You are in a HUGE storyline is going to revolve around you… You’re a warrior, you’re a skitter killer and you’re a badass!” From what Remi had told me, I knew Connor was going to have to step up big time this year. Not just physically but also in terms of his role on the show. His was going to be a central, pivotal role. To his credit, Connor hired a trainer that day and did start to work out. I think you can tell from his performance in the first two episodes that he came to play. I also took pride in supervising his haircut and wardrobe overhaul. I knew he was going to have to come off as an action hero. 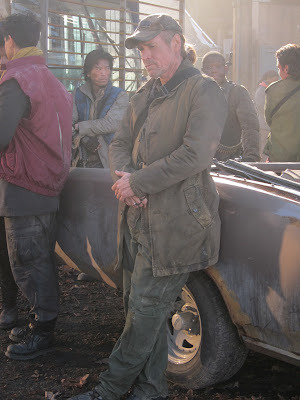 I also informed him – “You have skitter blood in you – you don’t feel pain, you don’t feel cold – and that means that when the rest of the cast is huddled up in big thick overcoats, you’re going to have to wear a t-shirt. Connor was up for all of it, and I’m very proud of him. There are two examples I’d like to mention of what he accomplished on the physical side -- The first was the jump from the window early in the first episode. What was written in the first draft was that Ben Mason ran down the interior stairs to kill the skitter. My idea was, if the harness is giving him powers, and since we saw Rick climbing around on the ceiling last year -- why not have Ben just leap from the window and kill the skitter. To complicate this idea (I like to complicate things) I wanted him to leap from the window, draw his knife and attack the skitter all in one shot, with no edits to hide anything. This required Connor to do a very difficult action…. He was in a harness and, what is called, a descender rig when he did the jump. That alone takes a lot of balance and concentration to jump from 20 feet down and land gracefully is hard enough. But he then had to draw the knife and advance and make contact with the skitter, while the line that had dropped him was unspooled behind him – and he had to keep his performance going. I really do believe that, sometimes, when you raise the level of difficulty very high for an actor – it allows them to get out of their head and not over think. Anyway, Connor pulled off this moment very well and it was important because it re-sets his character for the audience for the entire season. The second example is where Ben swims across the river. It’s discussed in the scene that he doesn’t feel cold. Well, when we shot that scene it was November… in Canada! The water was freezing! Connor had a small wetsuit under his wardrobe, but he was in a short-sleeved shirt. I knew I was probably only get one take at it before Connor went into hypothermia. So I set up a number of cameras on the shore to get t all in one. Connor dove in and swam out, and then he swam back to a slightly different part of the shore. I could tell he was barely hanging in as he came out of the water so I shouted out instructions. “Stand tall! Look right! You’re focused! You’re intense. Now walk towards me! Keep walking! Keep your intensity!” I don’t usually shout out instructions in the middle of the take – but I could tell that because of the crazy cold of the water he was barely holding it together. The minute he passed camera, costume people grabbed him and threw blankets around him. He jumped in a hot tub we’d set up on the shore and revived him. I was quite proud of his commitment. In terms of performance – one of the best scenes in either episode (IMHO) is the one where Ben shows Tom his back, where the spikes have grown, where he tells him he survives on his hatred. This was an unusual scene because it was very much delayed in production. It was scheduled early in the season, on a day where we dropped some work and then the scene just lingered and lingered around. We ended up shooting it during episode #4… I think this ended up being for the best. It was a beautifully written scene and by the time we got to it Conner and Noah had gotten in the groove of working with each other with the new Ben dynamic. I didn’t do too much work – and really contributed only two significant ideas to the scene in terms of staging… The first was that, after Tom says, “You’re not a freak” I had Ben stand and slowly close all the curtains on the med bus. I Thought this would draw out the tension. Then I staged it such that Ben looked away from Tom with both his face and Tom’s towards camera as he removes his shirt. Later, Noah made a big contribution to the editing of scene. 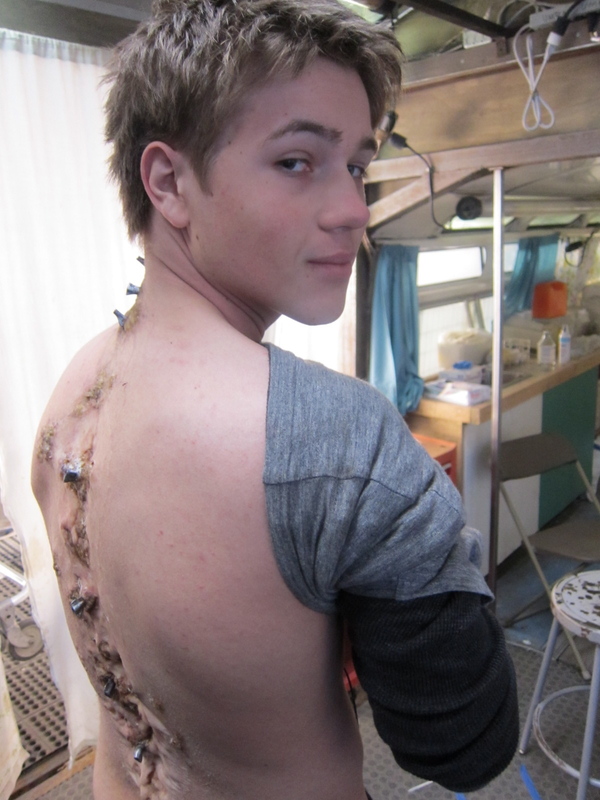 In the original cut I went from Connor facing camera and removing his shirt, to the shot of Conner’s back covered with skitter scales and then to Noah’s tearful close-up. When Noah saw the cut he suggested putting his close-up in before the shot of Ben’s back. He said he thought it would make the scene play more from his point-of-view. By delaying the reveal of Ben’s back it would draw out the tension and underscore Tom’s distress as a parent over what is happening to his son. We did that change and it worked out great! The interior of the spaceship is another sequence worth talking about. As you all remember, at the end of season 1 we’d painted ourselves into a corner by having Tom walk aboard the alien spaceship. Well, as season 2 was ramping up… very early in the process, we all had a meeting with Steven Spielberg. He thought that the it was very important that Tom had a face-to-face negotiation with the Overlord and that the Overlord’s position should be to offer Tom sanctuary in a “green zone” as long as the 2nd Mass agreed to surrender. Mr. Spielberg was also very involved with the design of the spaceship’s interior. 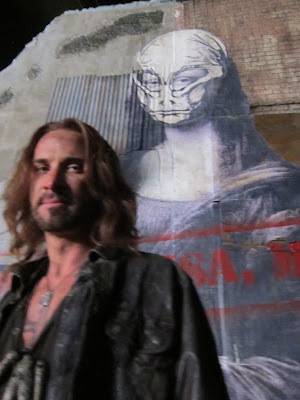 Our production designer Rob Gray created the original designs. Rob’s idea was to continue the theme we began with the harnesses. That the ship’s computer would be made of the same organically grown intelligent material that was used to harness earth’s children. He created a kind of throne room with these weird bubbling masses behind the overlord. To Remi it was important that the spaceship not be too “far out” and psychedelic but that it be clearly a ship of war. These two complimentary ideas drove Rob and myself as we created the first designs. We also knew we weren’t going to have an “establishing shot” of a spaceship floating above the earth. But it needed to be clear that Tom was above the planet. Somewhere it came along that the floor should be glass and that we could see down to the Earth below. We worked on these quite awhile before sending them to Mr. Spielberg. He generally liked the two or three choices but had a number of specific ideas about the texture of the surfaces and the look of the throne and that the alien should be on a platform above Tom to make him even taller, and so on. The designs took awhile… We decided to only build Tom’s chamber and the hallway and make the throne room a full digital set which we would shoot on blue screen. I had the idea, early on, that Tom’s cell should be a small confined space that was coffin-like and almost floating. Rob built it with this thick spidery web’s surrounding it – almost like Tom was inside of some kind of cocoon. I loved the design but there was no way to get a good camera position. I had the idea of shooting that scene with a small hand held “lipstick” camera and I even ended up operating the camera myself. I’ve used this technique once or twice before and it’s great because you can make weird sudden moves with the camera that are quite disturbing. And also, you can get incredibly close shots with focus right up to the lens – such as the close-up of Tom’s eye and Tom’s screaming mouth. Now, shooting on an all blue screen set can be a very disorienting proposition for the actors. Especially when not all the design decisions have been locked down. As a director, my main job was to paint a picture for Noah and Jessy Schram of what the dimensions of the ship would be, how tall the alien would be and how it would move. We wanted Noah to have something to relate to… So we hired actress Karen Konoval to play the alien off-stage for him. Karen is a wonderful Vancouver-based actor, who had had the major advantage of playing "Maurice," the orangutan in “Rise of the Planet of the Apes.” In that film she had done all of the motion capture acting which became the orangutan’s performance. The only problem for us is that Karen is about 5 foot 2 and the overlords is 10 ½ feet tall. So we built Karen up on a riser and once even put her on stilts. There was no way for her to do the shot where the overlord leans down and gets in Tom’s face, though – so for that moment, Noah got to act to a tennis ball on a stick, which we slowly lowered down towards him to give him a shifting eye-line. The final thing I’d like to discuss is the bridge sequences the second episode, particularly the extended sequence at the end of the episode. Between the opening, where Dai shoots down the alien aircraft (we call them “Beemers”), the scene where Weaver and crew examine the damage, and the final, very long, action scene – there were about 20 pages set at the bridge. 20 pages out of a 50-page script! The problem, however, when we went out to find a bridge to film – all bridges in Vancouver where either (a) working bridges which people use to get it and out of the city or… (b) Dilapidated wrecks, which have been decommissioned. Trust me, we looked and we looked and we looked for a bridge… And there were none. At one point in the process we even seriously considered the idea that the 2nd Mass would build a series of pontoons to get across the river. By making this decision I upped the degree of complexity it would take to film the sequence by much more than double. But that’s not all, because within the story there were also many stages of the bridge… i.e. the bridge before a big hole was blasted in it, the bridge with a big hole blasted in it, the bridge once Jamil had patched it up, the bridge with all the vehicles driving across it and then, finally, the bridge with all of the abandoned vehicles parked on it. So, in my mind, I had to divide up all these sections and block shoot the “A” and the “B” sides of them as well. AND… On top of all that there was a lot of detail left out of the script. The writers didn’t do anything wrong when I say this, it’s just that they had to write the script to be an exciting read… i.e. as if it was cut together and finished. So the script described Tom and Matt in the bus talking, then it cut out to the advancing mech and then it cut to Hal’s team on the hill, and then back to Weaver ordering people off the bridge, etc. etc… But when I shot it I had to fill in all the left out parts. For instance, even though the script goes away from Weaver’s story for a minute or two in one area – I still had to invent and shoot everything that happened in those missing moments. Trust me, to try to shoot around that would have added an EVEN BIGGER level of complexity. 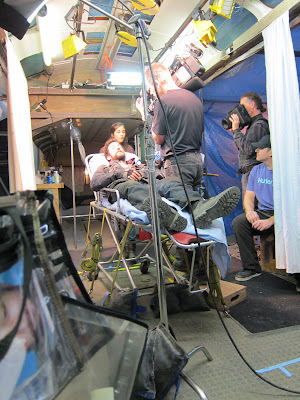 As you can imagine, it was an incredibly complex sequence that had to be shot over 5 full days – including 3 all-nighters. 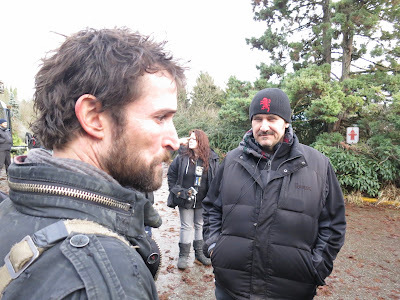 So we shot 2 split days (where I did the day scenes first and then went into night work) and 3 shooting days from dusk to dawn on 3 separate nights in the rainy cold of Vancouver. And on top of all that…. To try to schedule it so specifically that I could bring the actors in on precise tight schedules was impossible. So I had to do, what’s referred to in the film business, as “A John Ford Call.” This means that all the actors had to be brought in at the beginning of the day and sit around until it was time to use them. The shifting weather and complexity of shooting meant that I couldn’t plan with extreme precision exactly what scenes and shots I’d be doing at any moment. This meant that some actors (Moon Bloodgood in particular, as I remember) were called in early and sometimes didn’t work all day. All this adds up to the fact that this scene was 100% NO FUN to shoot – it was a long, hard, complex brain twister… And, although I felt pretty confident, I wasn’t perfectly sure it was all going to go together until I saw the first cut. Luckily for me, the editor, Don Aron is one of the best I’ve ever worked with. When I finally saw the sequence cut together it was great. Even to this day I can hardly believe how smoothly that crazy sequence went together. All right – that’s it for now – these double up episodes are a killer to blog about. Here come the pictures and I’ll be back next week… When tragedy befalls the 2nd Mass. THE MED BUS UNDER CONSTRUCTION! MR. WYLE RETURNS TO ACTION! RE-UNITED AND IT FEELS SO GOOD! CONNOR IN HIS SKITTER-BACK MAKEUP!!!! THE 2ND MASS - READY FOR ACTION! THIS WAS OUR SET - WE BUILT IT! CRAZY!?! THE STORYBOARDS - WE CROSS OFF THE SHOTS AS WE SHOOT THEM! 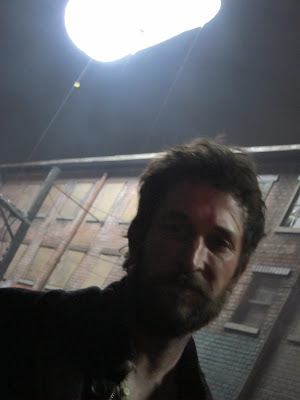 I DIRECT NOAH WYLE USING PSYCHIC POWERS ALONE! TRAILER THAT RAN WITH "THE AVENGERS"
Thanks for blogging about the making of the episodes again this year! I've been reading you blog since you started doing it "Heroes" and it's always really interesting to see how this episodes come to be. Thanks again! Ha ha! Is the inspiration for the alien salute that Noah and Jessy are doing from the movie 'Mac and Me'? It's one and the same. That used to be my favorite movie when I was little! By the way - where can we send our questions? What is your typical schedule for putting up blog posts about episodes? I think I'm wearing out my browser refresh button. Loved this entry. Can't wait for next. suits for women doesn't have the history nor the budget to make 10,000 handbags out the gate! I don’t think Aaron intended to die to free JSTOR, and I think what happened in this case made it far bigger kombi servisi than the initial political protest Aaron was attempting. It started out as being eca kombi servisi about who gets access to taxpayer funded research, but now it is about the way the Iron Heel of the State comes down, hard, on anyone beylikdüzü kombi servisi who dares to protest.